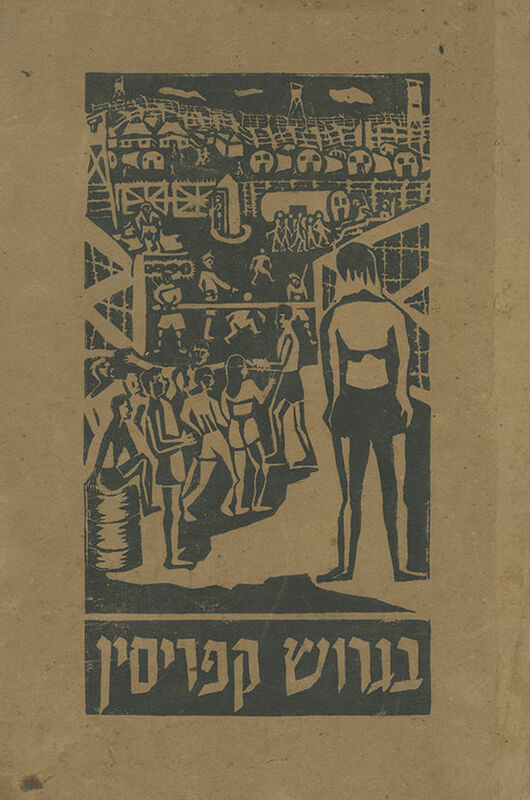 "Begerush Kafrisin" [In the Cyprus Exile], album with twenty-six linocuts portraying the life of She'erit Hapletah in Cyprus detention camps, by art students, exiles in Cyprus, tutored by Naftali Bezem. Cyprus, [ca. 1948]. On the first leaf is a handwritten note: "this book was prepared by art students at the Instructors' seminar and was printed and bound by the students in 120 copies". A dedication appears on this page: "for Moshe Brachman, in memory of Cyprus days, with appreciation and respect, Baruch Rubinstein for the instructors' seminar in Cyprus camps. 1948". Brachman, one of the heads of the "Committee for Cyprus Exiles", visited the camps in March 1948. The album opens with a short quote from the will and testament of Pinhas Rutenberg: "… We will be brothers in life, in creating, in action, and in building". On the following page is a short introduction: "Cyprus is one stop on the road of suffering en route to The Land of Israel. For Jews it meanes barbed wire fences, enforced idleness and being condemned to atrophy, but even within this reality, life is thriving. Of these it is told in this book by members of the camp of Israel in the Cyprus exile". These two leaves, and the list of prints appearing on the last leaf, are also linocuts. The Pinchas Ruthenberg Seminar, financed by the JDC, operated in the Cyprus deportation camps from mid-1947 to 1949. The seminar offered diverse courses, and teachers were brought to Cyprus to instruct the classes. Among the teachers were artists (Naftali Bezem, Zeev Ben-Zvi and others) who instructed art workshops. leaves, 49 cm. Good-fair condition. Original binding with a linocut. Minor blemishes and stains. Tear to front endpaper. Loose binding. Stains, tears and blemishes to binding.